Logitech Harmony Elite wants to remote control your home | What Hi-Fi? Logitech's remote control business was on the brink of being sold a few years ago but today the company has launched a number of new devices, capable of controlling more kit than ever. 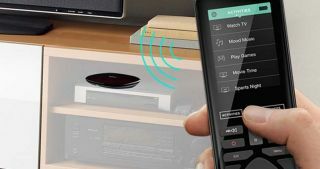 As well as new Harmony universal remotes, for which Logitech is arguably most famous, you can also now take control of selected smart home devices, such as Sonos, and use a dedicated app on your smartphone or tablet. The Harmony Hub (£100) is the box that turns your phone or tablet into a remote control for your AV kit, and can also control wi-fi-connected lights, thermostats and other smart home devices. The Harmony Companion (£120) kit gets you a Hub and one of Logitech's basic remote controls, should you want the option of an actual handset alongside the app. The new Harmony Elite (£280) is a more advanced universal remote and comes supplied with the Harmony Hub, allowing you also to control your kit via the app. The Elite can control up to 15 devices and has a colour touchscreen, backlit buttons and a replaceable, rechargeable battery. Last but not least is the Harmony 950 (£200), a standalone universal remote control that offers a similar specification to the Elite remote above, but doesn't come with the Hub, app control or ability to control other smart home devices. Some of the supported smart home products include Sonos speakers, Nest thermostats and Philips Hue lightbulbs. The new Logitech Harmony range is on sale now.